A Virginia mother is in jail and facing felony charges after she left her three young children in a 150-degree minivan while she went to work, police say. 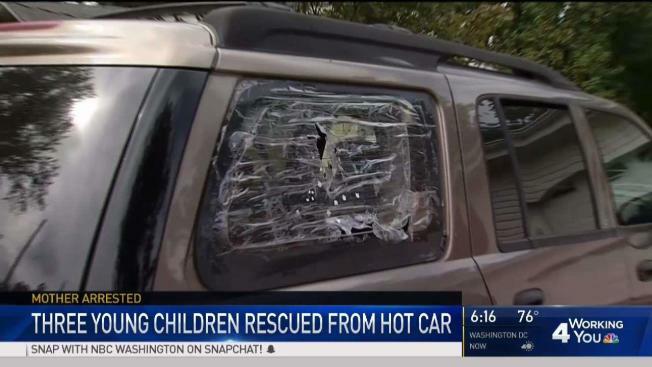 Alexa Faulkison, 26, was arrested Tuesday after she left her 5-year-old, 6-year-old and 7-year-old children in the sweltering minivan for at least 45 minutes, Fairfax County police said Thursday. Her boss, immigration attorney Sam Hasan, said Faulkison previously had child care plans, but they fell through. "I think she probably thought that she could keep the kids with her in the car as she went back and forth to work," he said. Faulkison's boss said the crime was "very uncharacteristic" of her. “She’s a very good employee," he said. Faulkison works in his office as a filing clerk, heading back and forth to court several times a day with documents. “I think she didn’t think that she would be out of the car for that long. I’m assuming," Hasan said. He said that if he had known her children were with her, he would have told her she could bring them inside. He guessed that she had not wanted to ask because she was new to the job. The children were found inside the van, suffering from heat exhaustion, because of an alert man who saw something wrong and called police. A man walked by the van, parked on the 5600 block of Columbia Pike, and noticed that plastic covering one of the side windows had been damaged. “Apparently there was some plastic over one of the windows or a portion of the window and one of the children had poked a hole in the window to get more air in the car," Pfc. Courtney Young said. Then, the good Samaritan saw the children. He called police right away, at about 2 p.m., police said. Officers arrived, got the children out of the van and rushed them to a hospital. Faulkison was charged with three felony counts of cruelty to a child. The children are now with their stepfather, police said. News4 tried to talk with Faulkison's family. At her home in Falls Church, a man opened the door but declined to speak with News4's David Culver. A minivan with ripped plastic over a side window was parked in the driveway. Police say that even with the car windows slightly open, on a 93-degree day, the temperature in a hot car can still get up to 140 degrees in 40 minutes. “It can get so hot in a car so quickly, especially when it’s sunny out, that we just advise no one leave children or animals in a car, even if you’re running a quick errand," Young said. The situation could have ended in tragedy, Lyn Balfour said. Her 9-month-old son Bryce died after she accidentally left him in a car for seven hours. "There's not a day goes by that I don't think about my son. Think about the fact that I thought I had dropped him off and I didn't," she said. Balfour advised parents to not be fooled by mild weather. As of September 2017, 739 children have died in vehicles due to heatstroke since 1998, according to NoHeatStroke.org. To avoid accidentally leaving children in a car, experts recommend using visual reminders such as placing your bag, briefcase or even your shoe in the backseat with your child, or telling yourself out loud, "remember to get the kids" or "don't forget the kids."